Each year Radar Roy does extensive testing on various radar detectors and laser jammers and publishes his reviews and videos here on RadarDetector.org and on RadarBusters.com. Roy then rates the detectors using his 5-Star rating, with detectors in the 5-Star Category ranking the best. 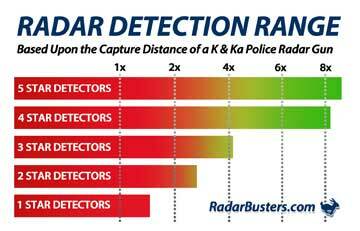 Currently the only radar detector that holds the honor as being rated as a 5-Star radar detector is the Passport Max2. Radar Detectors ranked as being 1-Star radar detectors do NOT have the performance you would need to beat a radar detector speed trap, because of this he does not recommend that you purchase one.